prospects of the market to a certain extent. attention over the report’s forecast period. 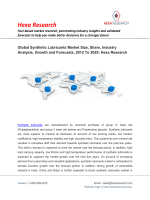 propelled the automotive market in Asia Pacific, subsequently driving the lubricants market. cars in China, has significantly contributed to the overall growth of the lubricants market in Asia Pacific. 7.5 Idemitsu Kosan Co., Ltd.